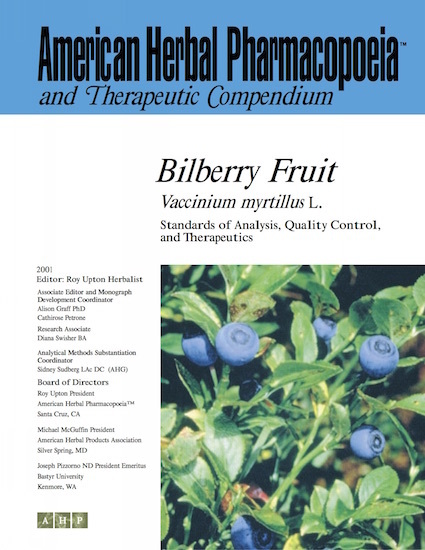 Bilberry (Vaccinium myrtillus) ranks among the top 25 best selling botanicals in the dietary supplement industry. It is one of the safest and most effective herbs for supporting the integrity of the vascular system and has broad health promoting properties, most notably antioxidant protection against eye diseases. Unfortunately, bilberry is subject to widespread adulteration with other anthocyanidin-containing fruits. The testing methodologies presented in the AHP monograph provide the basis for ensuring that manufacturers and laboratories obtain accurately identified materials and that adulterants can be detected. While use of bilberry extracts has focused on ophthalmic health, it has a wide array of beneficial effects that are underutilized and under marketed.